Tropical drinks and palm trees may be staples on many cruises, but for your next trip, why not try gluhwein and evergreens instead? With a winter-themed river voyage from AmaWaterways, you can combine two of your favorite things—Christmas and cruising—for your most memorable travel experience to date. The holiday season is the perfect time to visit Europe—you’ll avoid the summer crowds and enjoy the culture just as the locals do. Sure it's a bit colder during December, but seasoned travelers say that if you haven’t visited the legendary Christmas Markets throughout Germany, Austria, Hungary and France during the winter holidays, you haven’t truly experienced the best of Europe. Europe is where many of the world's most beloved holiday traditions began! Browse colorful market stalls filled to the brim with whimsical handicrafts. Take in the aromas of cinnamon dusted almonds and Lebkuchen gingerbread. Sip a mug of hot mulled wine beneath endless strands of twinkling lights. Nibble on roasted chestnuts while watching rosy-cheeked children unveil the world’s largest Advent calendar. These are the types of deep-rooted Yuletide traditions you’ll get to experience on a Christmas Markets cruise with AmaWaterways. AmaWaterways has dozens of itineraries to choose from that let you cruise through the heart of Europe during the most festive time of year experiencing the timeless tradition of its magical Christmas markets. AmaWaterways offers several 7-night itineraries featuring Christmas Markets along the Danube or the Rhine, ensuring ample time in port with many overnight stays, giving you the option for evenings in town or extended excursions. Insider Tip: Most Christmas Markets are open from the last week of November through December 22nd. AmaWaterways' friendly staff will make sure you feel the holiday spirit both onboard and on shore, with fully decorated ships, local entertainment, and complimentary beer and wine that will keep the celebration going! The holiday spirit permeates every moment of your travel, from the decorations on board and Christmas cookies in your stateroom, to Christmas-themed activities like tree trimming, caroling and surprises from Santa's helpers on your ship. Insider Tip: On one special night during each cruise, guests are encouraged to leave slippers (provided by AmaWaterways) outside their stateroom door, just as children do throughout Europe on St. Nicholas Day. Upon waking up the next morning, they’ll find their shoes filled with treats left by elves on the crew! AmaWaterways ships typically accommodate around 150 guests, giving you a relaxed, intimate experience far from the typical holiday stress. Despite the smaller ship size, you’ll find top-notch amenities like internet access, entertainment by local musicians, a heated pool with a swim-up bar, a fitness room, a spa, a hair salon, and some of the most well-appointed staterooms on the river. 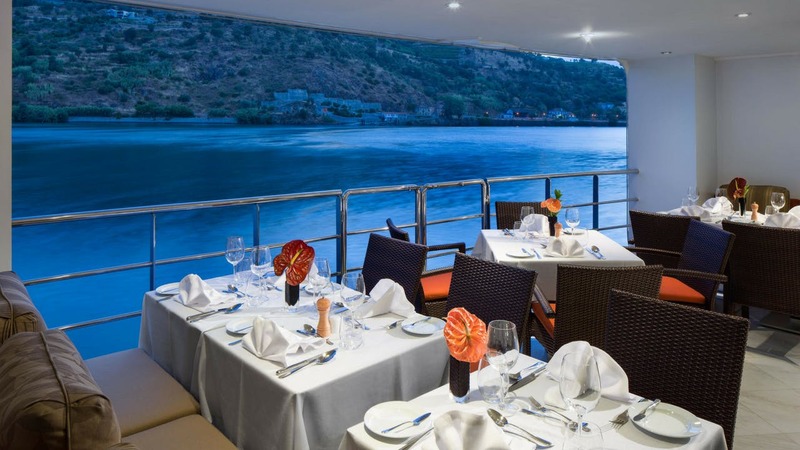 Whether it's from stateroom, on deck or while dining, every view onboard is stellar. Most of the very comfortable cabins feature private twin balconies, a French and a standard, so you can take in all of the picturesque scenery as your ship glides along the water to your next magical and merry destination. Specialty dining is included as well, including The Chef’s Table. Watch as the head chef expertly prepares each course of your locally sourced, seasonally-inspired dinner, complete with traditional holiday favorites and perfect wine pairings. AmaWaterways cruises features stops at the area's most famous and most authentic markets to give you an in-depth look at one of the most celebrated European holiday activities. As Christmas markets are popular among locals, you will delight in sharing an authentic seasonal pastime. You may even find you’re the only tourists in many of the most popular markets along the rivers. Remember, markets are open air, so be sure to pack your cold weather accessories or plan to pick up a new set as a souvenir! 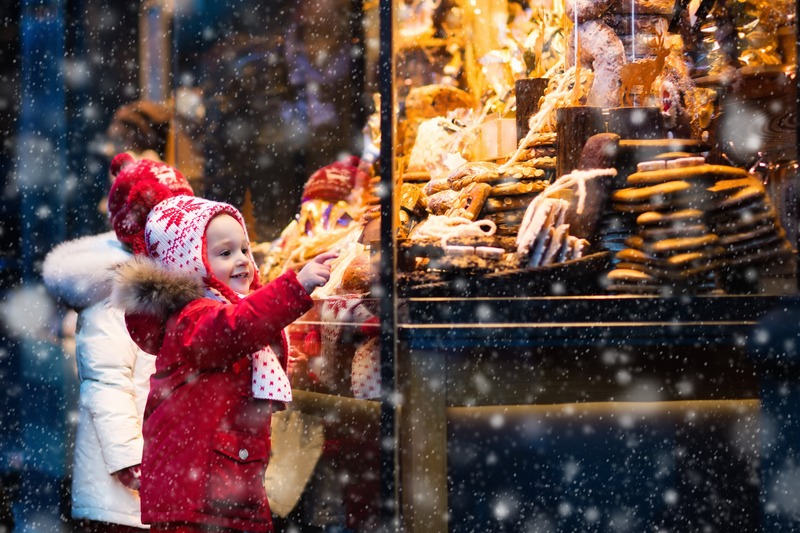 Embrace your inner-child as you experience Christmas like a local European. Check off every name on your shopping list with items like handmade nutcrackers, custom gluhwein mugs, festive ornaments, nativity scenes, wooden toys, intricate cards, cozy slippers, and handmade jewelry. Each market embraces the local personality, so ask around to learn what items are unique to each market. One item unique to each market is a collectible gluhwein mug, so if you purchase one at each market, you’ll come home with your own custom set! Markets offer entertainment as well, from music to parades to children’s skits and more. Discover Hungary’s largest market at Vorosmarty Square. Traditional cobblestone streets and a strict “handcrafted-only” policy makes it an ideal shopping spot for one-of-a-kind holiday gifts. In front of Vienna’s impressive 19th-century town hall, you'll find Christkindlmarkt and its 150+ vendor stalls filled with amazing decorations, incredible food, classic Christmas gifts and festive choir music. The self-proclaimed “Capital of Christmas”, this legendary city boasts the oldest, largest and most famous Christmas market in France, the Marchés de Noël. 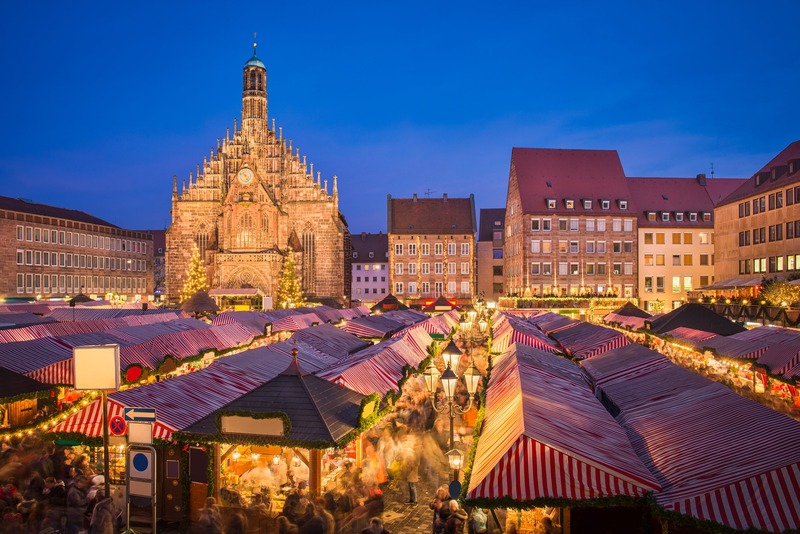 Nuremberg’s 400-year-old Christmas Market is one of the largest, oldest and most popular in all of Europe, with local flavors and live music throughout, plus hand-crafted souvenirs, a nostalgic carousel and a children’s steam train. The 18th-century Thurn und Taxis palace is the fairytale-like backdrop of Bavaria’s most romantic Christmas market. The distinctive and delicious food found here is worth the trip alone, especially their seasonal specialty of fresh dumplings in vanilla sauce! Shimmering in the shadow of the city’s elaborate landmark cathedral, Cologne’s Christmas Market offers one-of-a-kind crafts and out-of-this-world snacks like their famous Reibekuchen—mouthwatering potato pancakes served with fresh applesauce. Insider Tip: ATMs can be sparse and many vendors do not accept credit cards, so have euros on hand so you'll always be prepared to purchase that special souvenir. With the ease and efficiency of land travel in Europe, you can also easily extend your holiday trip to further enjoy one of the Christmas Markets or see a nearby city not on your itinerary. For example, if you book a Rhine itinerary, consider additional time in Paris and take the high-speed train to Basel for embarkation. Let your experienced CruiseInsider specialist take care of the hotel reservations to give you more time before or after your cruise to immerse yourself in Vienna, Prague, Budapest, Munich, or other famed European cities. Europe's Christmas Markets are throwbacks to timeless Yuletide traditions. A visit to Europe’s Christmas Markets is a magical experience. Learn about age-old traditions as you wander through the Christmas Markets enjoying artisanal gifts, ancient traditions and the aroma of local delicacies. 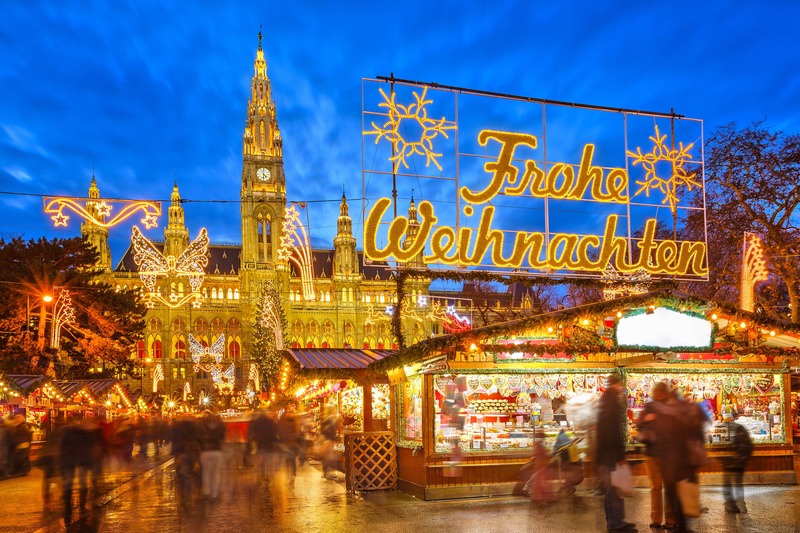 Why not slow things down next December with an AmaWaterways Christmas Market river cruise? By speaking to one of our travel advisors at (877) 734-6858, we can help deliver all of the magic of the season right to your stateroom! If only Santa had it this easy.